Straight lines and a smaller scale prevent this sofa from overwhelming a small room. A tight pulled back, flare arms, and wood block feet complete the look of simplicity and style. The Lakewood 78" Lakewood Stationary Sofa by Flexsteel at AHFA in the area. Product availability may vary. Contact us for the most current availability on this product. Pillow Includes two 09p-91 pillows in accent fabric. Seat Back Attached back with flair side shape. 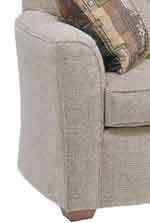 Seat Reversible deluxe foam cushions.